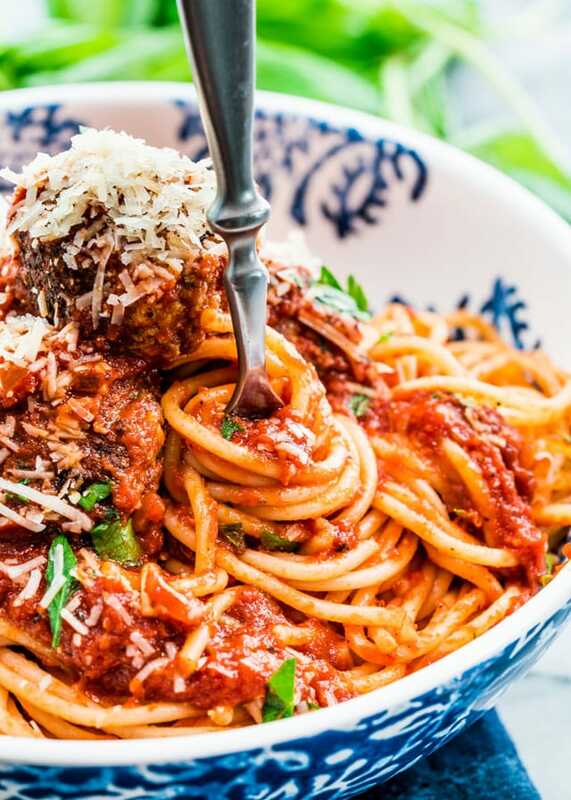 Classic Spaghetti and Meatballs – a classic comfort food and pretty much everyone’s favorite. This dish with delicious and hearty meatballs in a simple flavorful and tasty tomato sauce served over spaghetti. It’s time for Monday Meatball Mania again! Welcome! If you’re new to Jo Cooks, I started this Meatball-a-thon in January with my friend Nagi from RecipeTin Eats. The rules are simple, one meatball recipe every last Monday of every month, and that’s it as far as rules go. 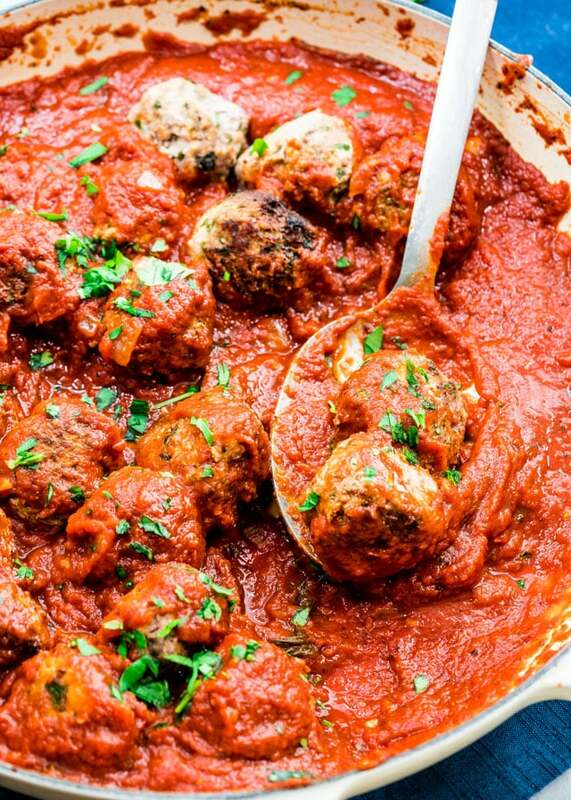 Whatever crazy and tasty meatball concoctions we come up with, we’ll share with you. Anything goes. 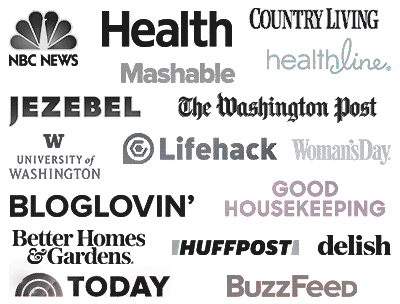 In the 8 years that I’ve been working on this blog, I just now realized that I don’t have a classic spaghetti and meatballs recipe, so here I am after all this time with probably the easiest and most popular meatball dish out there. A classic but super comforting spaghetti and meatballs dish, and not with frozen meatballs, but homemade meatballs! Because this post is about meatballs, after all. The meatball recipe is a pretty basic Italian meatball recipe loaded with herbs such as basil, oregano and parsley. They’re really easy to make too, you can use any ground meat your prefer. Traditionally they are made with beef, veal or pork, but it’s up to you what you use, really anything goes. The sauce couldn’t get any simpler, we’re talking crushed tomatoes, some onion, garlic, salt, pepper, crushed red pepper flakes and basil. Let it simmer and that’s all that’s really required. Another way I like to make this sauce is to roast my own tomatoes and then run them through the food processor, you could do that too if you wanted to and you’d have that nice flavor of roasted tomatoes. 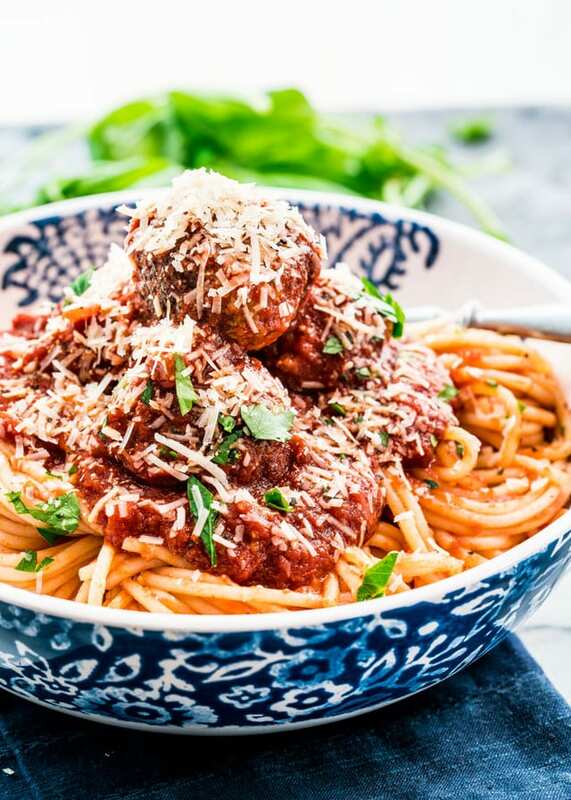 Serve these meatballs over spaghetti, drenched in this yummy sauce, and load on the Parmesan cheese. So good, and such a comforting dinner. It truly is everyone’s favorite. 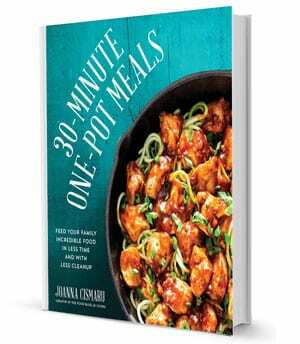 If you ant to try a healthier version of this recipe, try my Slimmed Down Spaghetti & Chicken Meatballs. 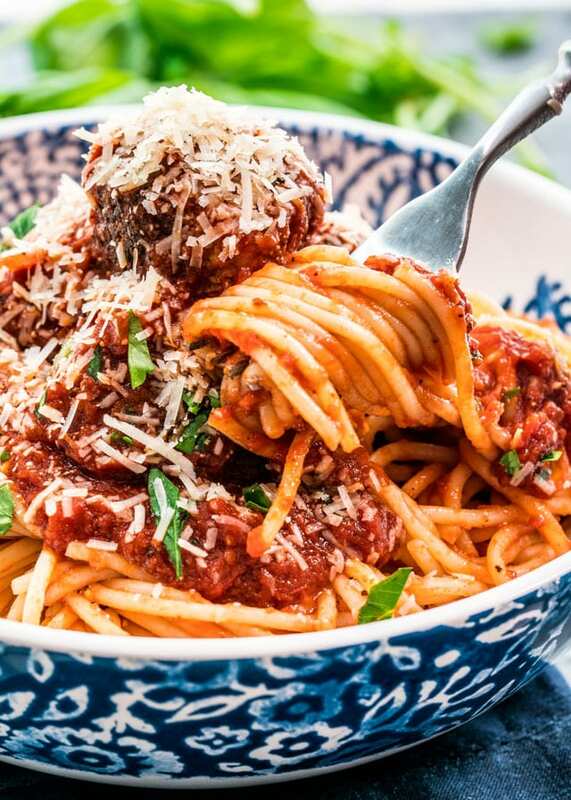 Spaghetti and Meatballs is a classic comfort food and pretty much everyone's favorite. 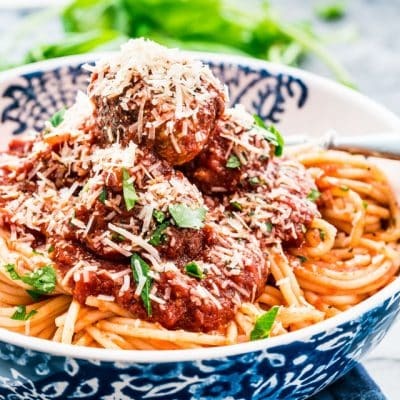 A classic dish with delicious and hearty meatballs in a simple flavorful and tasty tomato sauce served over spaghetti. Break the bread slices into pieces and place in a large bowl. Pour the milk over them and let the bread soak for about 10 minutes. To the same bowl add the remaining meatball ingredients. Mix well using your clean hands. Shape the meatball mixture into balls around the size of a golf ball. Heat the olive oil in a large skillet. Add the meatballs and saute until brown and cooked through. Turn them often so they hold their shape. You might also need to do this in a couple batches, depends on how big or small your meatballs are and the size of your skillet. It should take about 10 to 15 minutes per batch. Transfer the meatballs to a plate and set aside. If there's too much oil in your skillet, drain some of it out. You need about 1 tbsp of fat remaining in skillet. Add the onion and garlic to the skillet and cook for about 3 to 5 minutes until onion is soft and becomes translucent. Deglaze the pan with the chicken broth and scrape all the brown bits from the meatballs, this will add flavor to the sauce. Add the crushed tomatoes, red pepper flakes, salt, pepper and basil springs. Stir and bring to a boil. Reduce the heat to a simmer, cover the skillet with a lid and simmer for about 20 to 30 minutes, stirring occasionally. The sauce should reduce a bit. While the sauce is simmering cook the spaghetti according to package instructions. Reserve about 1 cup of the pasta water. If your sauce is too thick, add some of the pasta water to thin it out a bit until desired consistency is achieved. Place pasta in a large bowl and add about 1 to 2 cups of the sauce to the pasta and toss well. Add the meatballs to the remaining sauce in the skillet and toss. Serve the meatballs over spaghetti, sprinkled with Parmesan cheese and garnished with parsley or basil. Alternatively you can bake the meatballs at 400 F degrees for about 30 minutes until golden brown. If you feel like the amount this recipe yields is too much, you can hover your cursor over the number of servings in the recipe card. A slider will appear, and you can change the number of servings. The recipe will change accordingly. Oh I’ve made bitterballen before: https://www.jocooks.com/recipes/dutch-meatballs-bitterballen/ but haven’t tried the frikadeller! I just made this and my husband and I devoured it. He was hovering over me eating the meatballs while I was making the sauce haha needless to say, I’ll be making this again! I made this dish for my husband and he loved it. He thought it was the most authentic spaghetti ad meatballs I had ever made. I think she means why not have the recipe for a smaller amount eg the 2 or 4 person recipes.I don’t think she means 4 people can eat this much. Haven’t tried this yet but I plan to looks delicious . If you hover over the servings size, a slider should pop up and you can change the servings size to 4 or 2 and it will readjust the quantity of ingredients. Looks like a great, easy recipe. I will try! I like to let my meatballs simmer in the sauce (without stirring!) until done. They come out nice ‘n soft, just the way I like! Have you ever tried cooking them that way? Yes you could do that and I have done it as well. Why a recipe for 8 people, it would be far better for 4 or even 2 which is the norm? Oh no trust me, this makes a lot! A LOT! It really is for 8 people.